When I reflect on all the recent events that have transpired in our communities, our schools, and our world, I think about the environments and the culture in which we live, learn, work and play. I believe that we should, strategically, think about all the places where we can become more effective in changing cultures: in homes, schools and community-based organizations. We need to institute cultures where we can foster and measure connectedness, where we build caring attitudes, positive behaviors, mutual respect, acceptance and empathy for others into the standards of how we operate. Pictured above: Tina Brown, executive director of the Overtown Youth Center. We can establish a consistent training curriculum that is packaged, taught and adopted by organizations across Miami-Dade, including ways to implement an ethos of success, cultural competency and compassionate intervention/trauma-informed care. ALL kids in our program will succeed because we care and they have the capability. Treat every child like they are own. Every staff member needs a daily opportunity to tap into the emotions of our youth. 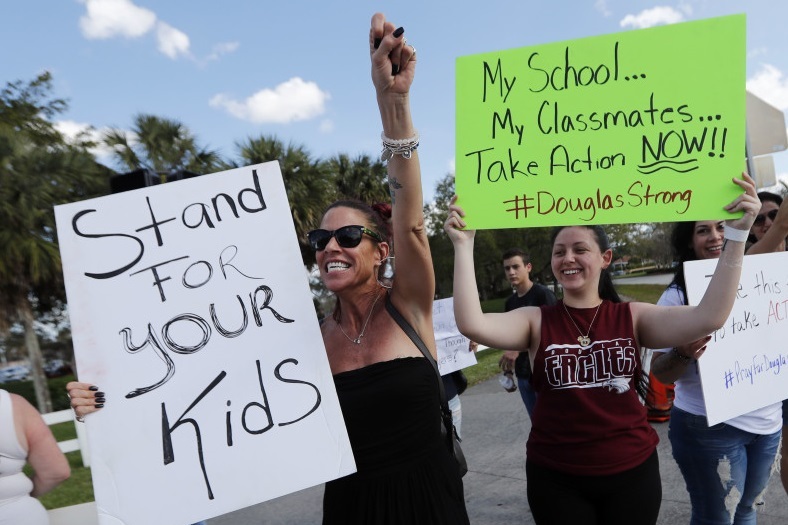 Pictured above: Lisa Madonna (L) joins Angelina Lazo (R), an 18-year-old senior at Marjory Stoneman Douglas High School, and other parents and students at a demonstration calling for more gun control at an intersection near the school, in Coral Springs, Florida, on February 18 (Associated Press). We can reframe schools to think about students as customers, where teachers and administrators are there to serve and leadership values their feedback, allowing students to inform the education experience. What does it feel like to walk in school? Are students being greeted by people who care? How do students feel when they leave the building? Does class start with the teacher showing kindness or just showing the objective of the day’s lesson? Is a culture of thoughtfulness exhibited throughout the building, on the field, in each classroom, in the cafeteria and on buses? How does it feel to walk into the principal’s office or a counselor’s office? Are students comfortable? Does it feel punitive rather than supportive and understanding? I strongly believe that gun violence is a symptom of a missed opportunity – an opportunity to change the way someone was treated or not treated, misdiagnosed or undiagnosed, cared for or not cared for, educated or uneducated, looked at but perhaps overlooked. No matter the situation, the environments and cultures in which we operate can work to combat acts of violence. Let’s strive to foster a culture of care; a culture that promotes kindness, connectedness and mindfulness; a culture of acceptance that embraces differences and diversity; a culture of consistency and equity; a culture of pause and patience; and, most importantly, a culture of support. Today, I challenge every home, every nonprofit, every school and every business to evaluate its culture of care. 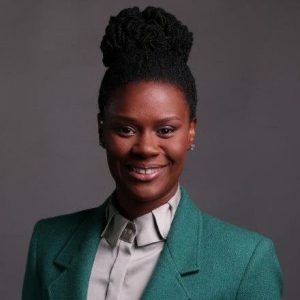 Tina Brown is the executive director of Overtown Youth Center. Thank you for sharing this. I could not agree more and we have a long way to go, specially in the school environment. Many are treated and known by the number and not the name. Many are switched colors because they were engaging in socializing with their neighbor. Many are told you get what you get and you don’t get upset. I could go on and on and all I can do is to step it up at home but by reading this I can go back you my child’s school and provide this as a beginning. Thank you! A huge problem is the lack of caring that exists in the home, broken homes, no one at home, no support systems for these kids from troubled homes. THAT is where the problem begins. School is a place of learning, and I find it sad that so many of these uneducated lemmings willingly go out to protest guns. The guns, and the NRA were NOT the problem in this case, a total lack of competence in government was responsible. The schools and Sheriffs office conspired to NOT report crimes, to improve the schools statistics, no one listened to the advice of the counselors, or the citizens reporting the behavior problems of this individual. The armed adults charged with protecting these children failed, utterly. Too bad no competent adult was permitted to provide defense to those left defenseless. But the guns were blamed. And the ignorant children are sent out by their NEA masters to protest. Too bad they were never taught American history, or the importance of having the ability to defend yourself with a gun- the very reason America stands today as an independent nation. EVERYONE IN POSITION OF AUTHORITY FAILED TO PERFORM THEIR JOBS, BUT THE GUNS WERE BLAMED. I agree with this. I feel we often are so in our own heads that we don’t realize our connections with others. I had this thought earlier while crossing the street when it wasn’t my turn, because I was only concerned with my own timeline of getting to work, It’s a very simple example- something petty that won’t be thought of by others again, but it showed a lack of caring on my part for my fellow community members. There are so many small ways we can care for our connections with other that we miss out on every day. I’m definitely challenging myself to start trying to catch those moments and hope others will be inspired by this article to do so as well. Wonderful article! We all have to do our part to support an environment of concern and care. One of the ways we have found effective in Bay County Schools is establishing organized Mentor Programs. I have been the Mentor Coordinator in our at risk, second chance school, New Horizons Learning Center since 1999.. It is truly making a difference in our student’s lives by letting our students know there is a special person who cares and wants to help them succeed. This year our Supt. of Bay District Schools, Bill Husfelt has also organized a successful mentor program for our at risk elementary schools. I also believe we need more Mental Health Specialist in our schools to address early those students who are dealing with mental health issues. Regardless of the different situations our young people are facing in their homes, school or community, every student needs to know someone cares about them. I agree with what you are doing. 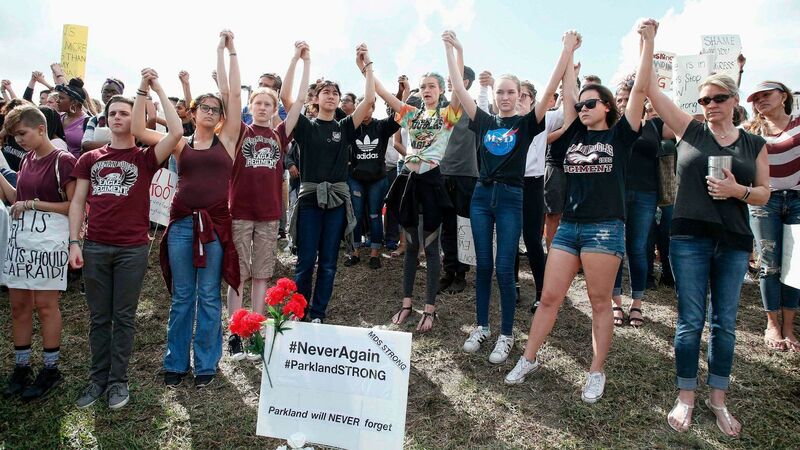 However, the only meaningful step will be to create a mass, grass-roots, movement of eligible voters who agree not to support or vote for a candidate, of any party, that accepts donations or other campaign support from the NRA and gun and munitions industry and their surrogates. That is the only way to elect politicians who will not feel beholden to, or frightened of, the gun lobby, and therefore more able to take a balanced approach to reasonable gun and ammunition safety regulation. Thank you Tina for sharing and leading the way with a reminder that we all take part in creating a culture of care. In our next coalition meeting with the Overtown Childrens & Youth Initiative non profits, I propose we add this to our agenda and create a plan on how we will support each other to create a coalition culture of care in all our efforts together to support overtown youth. This exactly what it needs to be said and work on. Sharing! I agree!!! Awesome sense of awareness and solution focus!!! You’re sooo dope, friend!!! So proud of you for you and this post!! !